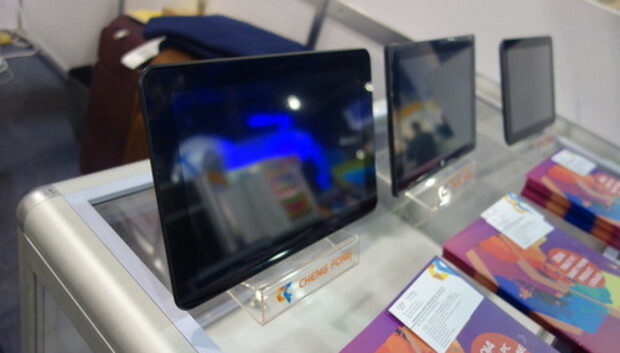 Consumers looking for a cheap tablet later this year will find some devices loaded with both Android and Windows 8, a new trend among Chinese manufacturers. Scores of tablets from Chinese vendors were on display at the International CES show in Las Vegas this week, running only Android or Windows. But several Chinese manufacturers are also advertising upcoming tablets that will load either one of the OSes on reboot, or switch between them during the device's operation. Four of the companies, all based in the Chinese city of Shenzhen, said at the show they'll start releasing the devices this quarter, with prices at around $250. Shenzhen Bmorn Technology displayed one such tablet, the W102, that it said can switch between the operating systems on reboot. It has a 10-inch, 1280 by 800 resolution screen, uses a 1.46GHz Intel Bay Trail processor, and comes with different storage and memory options. When shown on Tuesday, however, the tablet was not functioning and only showed an error message. Chinese manufacturers are already flooding the market with cheap Android tablets, under little-known brand names. In the case of Bmorn, the company primarily sells its tablets to customers in Europe and the U.S.
Another manufacturer, Shenzhen Cheng Fong Digital-Tech, said it's planning a tablet that can easily switch between the operating systems with a simple swipe of the screen. The company also ships tablets to Europe and the U.S. under different brand names. The upcoming tablet will use an Intel Bay Trail quad-core processor and has a 10-inch screen. Vendors have been experimenting with the idea of putting both Windows and Android on PCs and tablets in recent years. On Monday, Taiwanese PC maker Asus showed a PC convertible that can be used as both a tablet and a laptop, but also comes installed with both operating systems. An on-screen button lets users switch between Android and Windows with only a five-second wait in between. Another smaller, Indian-based vendor named Micromax also unveiled at the CES show a tablet called Laptap that can boot up with either operating system. It uses a 1.46GHz Intel Celeron processor, has 2GB of RAM and a 10-inch screen, with storage starting at 32GB. The tablet will be available starting in February, with a price between $400 and $500. It will primarily be sold in Russia and India. Is Artificial Intelligence breaking the code for women in technology?